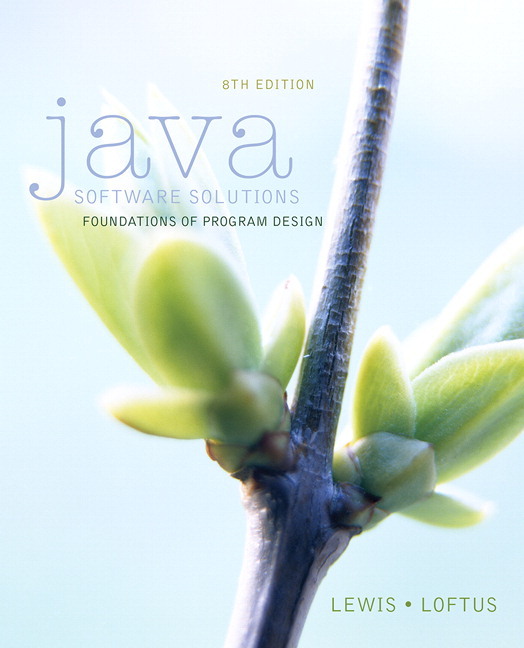 Java Software Solutions teaches a foundation of programming techniques to foster well-designed object-oriented software. Heralded for its integration of small and large realistic examples, this worldwide best-selling text emphasizes building solid problem-solving and design skills to write high-quality programs. MyProgrammingLab for Java Software Solutions is a total learning package. MyProgrammingLab is an online homework, tutorial, and assessment program that truly engages students in learning. It helps students better prepare for class, quizzes, and exams—resulting in better performance in the course—and provides educators a dynamic set of tools for gauging individual and class progress. Personalize Learning: Through the power of practice and immediate personalized feedback, MyProgrammingLab helps students fully grasp the logic, semantics, and syntax of programming. Help Students Build Sound Program-Development Skills: A software methodology is introduced early and revisited throughout the text to ensure that students build sound program-development skills. Enhance Learning with In-text Features: A variety of features in each chapter help motivate learning. Provide Opportunities to Practice Design Skills and Implement Java Programs: A wealth of end-of-chapter programming projects and chapter review features help reinforce key concepts. Support Instructors and Students: Resources to support learning are available on the Companion website and Instructor Resource Center. Note: You are purchasing a standalone product; MyProgrammingLab does not come packaged with this content. If you would like to purchase both the physical text and MyProgrammingLab search for ISBN-10: 0133796280/ISBN-13: 9780133796285. That package includes ISBN-10: 0133594955/ISBN-13: 9780133594959 and ISBN-10:0133781283 /ISBN-13: 9780133781281. MyProgrammingLab is not a self-paced technology and should only be purchased when required by an instructor. Through the power of practice and immediate personalized feedback, MyProgrammingLab helps students fully grasp the logic, semantics, and syntax of programming. A self-study and homework tool, a MyProgrammingLab course consists of hundreds of small practice problems organized around the structure of this textbook. For students, the system automatically detects errors in the logic and syntax of their code submissions and offers targeted hints that enable them to figure out what went wrong–and why. For instructors, a comprehensive roster tracks correct and incorrect answers and stores the code inputted by students for review. Programming practice: Your students will gain first-hand programming experience in an interactive online environment. Immediate, personalized feedback: Students will gain intelligent, immediate feedback by mining our large database of submissions to provide student-specific responses. Dynamic roster: Your students’ submissions are automatically evaluated, both saving you time, and offering students immedi¿ate learning opportunities. The color-coded roster gives you a quick glance of your classes’ progress. Easily drill down to receive information on a single student’s performance or submissions for a specific problem. Graduated complexity: Problems are broken down into short, understandable sequences of exercises, where each sequence relates to a particular topic. Within each sequence the level and sophistication of the exercises increase gradually but steadily. Step-by-step VideoNote tutorials: Step-by-step video tutorials enhance the programming concepts presented in the book by allowing students to view the entire problem-solving process outside of the classroom—when they need help the most. A powerful homework and test manager: MyProgrammingLablets you create, import, and manage online homework assignments, quizzes, and tests that are automatically graded. You can choose from a wide range of assignment options, including time limits, proctoring, and maximum number of attempts allowed. The bottom line: MyProgrammingLab means less time grading and more time teaching. Comprehensive online course content: Filled with a wealth of content that is tightly integrated with your textbook, MyProgrammingLab lets you easily add, remove, or modify existing instructional material. You can also add your own course materials to suit the needs of your students or department. In short, MyProgrammingLab lets you teach exactly as you'd like. A measured approach to objects first teaches students to use objects before learning to write them. Students see objects in Chapter three (before control structures), and then build their own objects in Chapter five (after control structures). Sound programming practices teach students how to write good software, not just how to program. Through examples and discussions, students learn how to solve problems and implement solutions using foundational software-engineering techniques. Fully implemented examples demonstrate specific concepts. Because students learn best through examples, small, readily understandable examples are intertwined with larger, more realistic ones. Graphics and GUIs are excellent examples of object orientation—and excellent motivators for students. An optional Graphics Track section covers graphics and GUIs at the end of each chapter, allowing for flexibility of coverage. UPDATED: Improved discussions of Java translation, text file I/O, and other topics. The authors improved discussions throughout the book, sometimes in minor ways, and a few include significant improvements. In particular, the discussion of Java translation was updated in Chapter 1 and throughout to focus on term JVM rather than the less helpful term interpreter. The figure related to the translation process was also updated. The text file I/O discussion was also updated, along with its example. Key Concepts. Throughout the text, the Key Concept boxes highlight fundamental ideas and important guidelines. These concepts are summarized at the end of each chapter. Listings. All programming examples are presented in clearly labeled listings, followed by the program output, a sample run, or screen shot display as appropriate. The code is colored to visually distinguish comments and reserved words. REVISED: Each example and code fragment was carefully checked to ensure that a consistent and appropriate style was applied. Syntax Diagrams. At appropriate points in the text, syntactic elements of the Java language are discussed in special highlighted sections with diagrams that clearly identify the valid forms for a statement or construct. Syntax diagrams for the entire Java language are presented in Appendix L.
Graphics Track. All processing that involves graphics and graphical user interfaces is discussed in one or two sections at the end of each chapter, collectively referred to as the Graphics Track. This material can be skipped without loss of continuity, or focused on specifically as desired. The material in any Graphics Track section relates to the main topics of the chapter in which it is found. UPDATED: The displays of screen shots for graphics-based programs, including programs with graphical user interfaces, have all been updated. UPDATED: Additional screen shots have been added for some graphics programs in situations where it was beneficial to see how the program window looks under different situations or window sizes. Software Failures. These between-chapter vignettes discuss real-world flaws in software design, encouraging students to adopt sound design practices from the beginning. Summary of Key Concepts. The Key Concepts presented throughout a chapter are summarized at the end of the chapter. Self-Review Questions and Answers. These short-answer questions review the fundamental ideas and terms established in the preceding section. They are designed to allow students to assess their own basic grasp of the material. The answers to these questions can be found at the end of the book. Exercises. These intermediate problems require computations, the analysis or writing of code fragments, and a thorough grasp of the chapter content. While the exercises may deal with code, they generally do not require any online activity. Programming Projects. These problems require the design and implementation of Java programs. They vary widely in level of difficulty. UPDATED: Revised end-of-chapter exercises and programming projects. To provide an appropriate and updated set, the authors added, subtracted, and modified the end-of-chapter exercises and programming projects. MyProgrammingLab. Many of the problems in the book can be done online in MyProgrammingLab. Through practice exercises and immediate, personalized feedback, MyProgrammingLab improves the programming competence of beginning students who often struggle with the basic concepts and paradigms of popular high-level programming languages. VideoNotes. VideoNotes are step-by-step video tutorials specifically designed to enhance the programming concepts presented in Lewis, Java Software Solutions: Foundations of Program Design, 8e. Students can view the entire problem-solving process outside of the classroom—when they need help the most. VideoNotes are available with the purchase of a new copy the book. Go to www.pearsonhighered.com/videonotes for a brief VideoNotes demo. VideoNotes: short step-by-step videos demonstrating how to solve problems from design through coding. VideoNotes allow for self-paced instruction with easy navigation including the ability to select, play, rewind, fast-forward, and stop within each VideoNote exercise. Margin icons in your textbook let you know when a VideoNote video is available for a particular concept or homework problem. Solutions—includes solutions to exercises and programming projects. Updated all graphical screen shots. The displays of screen shots for graphics-based programs, including programs with graphical user interfaces, have all been updated. Added additional screen shots to show interface options. Additional screen shots have been added for some graphics programs in situations where it was beneficial to see how the program window looks under different situations or window sizes. Revised all code for consistent spacing issues. Each example and code fragment was carefully checked to ensure that a consistent and appropriate style was applied. Improved discussions of Java translation, text file I/O, and other topics. The authors improved discussions throughout the book, sometimes in minor ways, and a few include significant improvements. In particular, the discussion of Java translation was updated in Chapter 1 and throughout to focus on term JVM rather than the less helpful term interpreter. The figure related to the translation process was also updated. The text file I/O discussion was also updated, along with its example. Revised end-of-chapter exercises and programming projects. To provide an appropriate and updated set, the authors added, subtracted, and modified the end-of-chapter exercises and programming projects. 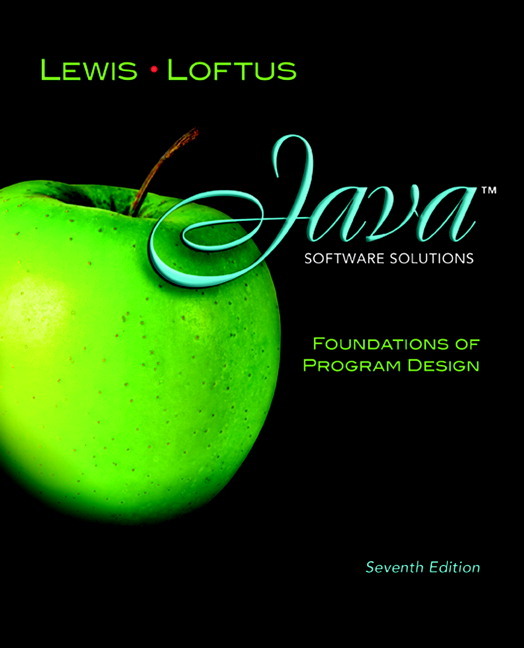 John Lewis is the co-author of the previous editions of the Java Software Solutions textbook, Java Software Structures , Java Foundations , and the Java Software Solutions textbook used for AP computer science classes.